Micro Corrugation Machine– Micro Corrugation Machine manufacturer in Mumbai and Micro Corrugation Machine supplier in Mumbai, India. 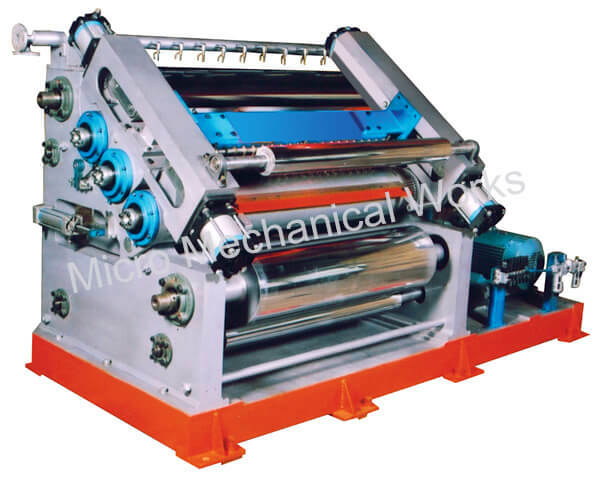 Micro Corrugation Machine- We are Micro Corrugation Machine manufacturer in Mumbai. Design speed : 80 mt/min. Adjustment of upper corrugating roller, pressure roller and glue roller is controlled by pneumatic system. Gap between glue applicator roller and doctor roller is controlled manually. Pre-heater for liner paper and pre-conditioner for fluted media paper. With manual dividing glue device. Direct Roll drive gear box. Andheri East, Mumbai - 400093. Micro Mechanical Works is an organization dedicated to the development of corrugated packaging machinery in India. With the expertise gained from over 5 decades of experience in Machine building, Micro has joined the ranks of the world's leading names in corrugated packaging machinery by designing, developing and building machines that reflect engineering excellence and outstanding performance.